1) It’s a Lanolips balm. Non-sticky, ultra-moisturising and long-lasting. 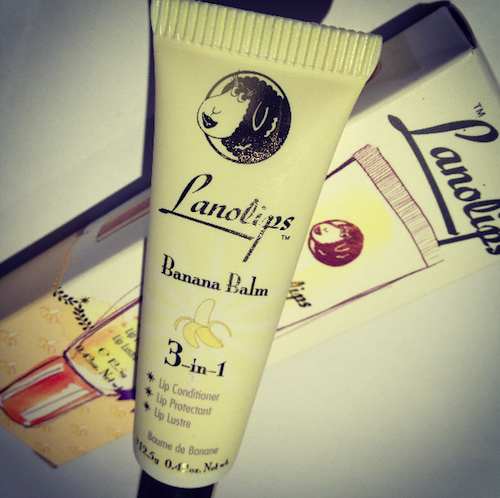 Seriously – Lanolips is the kind of balm that you pop on at night and still feel the effects the following afternoon. Those who hate banana will almost certainly hate the Banana Balm, those who like it, love it or are simply indifferent to it will all be applying this stuff every day for the whole winter. I have to say, though, that if you hate bananas, Lanolips do plenty of other versions – you can see the range here. Don’t let the bananas put you off! And for those wanting to give the new Banana Balm a try, rest assured that it’s not just the standard balm with an artificial banana smell thrown in – it contains actual banana extract. Shea, Beeswax, Coco Butter and a heap of Lanolin, too, obviously. All great at holding the moisture in and keeping your lips soft and un-flakey.